Characters: 4 actors: *male roles are played by two performers. Running Time: 80 to 90 minutes approx. In 1924, a man from London’s National Gallery visits Johanna Bonger in Holland and makes a substantial offer for a painting of Sunflowers. This is where we begin. In 1891, Johanna Bonger was Theo Van Gogh’s wife for only 2 years, and their young son Vincent Willem, was a year old when Theo died – 6 months after his older brother, Vincent. As his own family didn’t believe in him, they were now the custodians of Vincent’s art (paintings and drawings, numbering over 600 all told). Johanna was devastated, having watched her Theo slowly succumb to his own madness in an asylum. She was told by most of her family and friends to just get rid of the art, as it was deemed worthless and Johanna was educated as an English teacher, not an art dealer. She refused. Fueled by a deep love for her husband and inner drive and passion that most people underestimated, Johanna decided to take up Theo’s mission to bring Vincent’s art to the world. As a widowed single mother, she opened a boarding house, determined to support herself and young son on her own. She organized and translated Vincent’s letters, slowly began loaning Vincent’s art to different galleries across Europe, selling a few here and there to cover the immense costs. For 35-years up to her death in 1925, she was unwavering in her efforts. Without her, the world would not know the name Vincent Van Gogh beyond footnotes in others artist’s biographies. And we certainly would not know his art. Johanna Bonger, the woman who saved Van Gogh. Three people, actors, characters meet in a space that looks similar to a theatre stage. They immediately try to show/prove how much they love. Grand statements are made, running on the spot, arguing, debates, agreements and declarations power this play from start to stop with a rhythm and pace that will leave everyone out of breath. Part one – ‘Joyful Defiance’: Small apartment in Nashville. Part two – ‘Parchman Farm Variety Hour’: Parchman Prison Farm in Mississippi, Abstract/Absurd space. In the spring of 1961, the Congress Of Racial Equality (CORE) began the Freedom Rides. A biracial operation of direct non-violent action to desegregate the south by riding buses from Washington to New Orleans by testing the legitimacy of the Morgan (1946) and Boyton (1960) decisions which made it illegal under federal law to discriminate against inter-state travellers. Young Riders tells the story of four young members of SNCC (Student Non-Violent Coordinating Committee) who made the courageous (some say irresponsible) decision to continue the Freedom Rides after the original riders were brutally attacked in Alabama causing the organizers to cancel the remainder of the Ride. We meet the four activists in a small apartment in Nashville as they celebrate a local victory desegregating movie theatres. After hearing of the attacks, they volunteer to re-start the Rides, which would almost guarantee violence upon them. Not everyone found the strength to go. As the play develops we descend into the nightmarish world of the Parchman Farm Maximum security prison in Mississippi where many of the freedom riders were sent after being arrested for ‘Breach of Peace’. The play pushes the absolute absurdity of the Jim Crow south to its extreme, bending time and space – bringing current events into the narrative – by introducing the young Freedom Riders to the ‘Parchman Farm Variety Hour’, a ludicrous game/variety show with skits, contests and re-enactments – all played with maximum earnestness. Young Riders shines a light on a moment in the Civil Rights movement that started as a simple idea but ignited a national debate and rose to the heights of the Federal Government. The play also makes it painfully clear that the struggle for equality is constant by exposing the overlaps between then and now. Young Riders also calls attention to our constant and growing need to listen more and talk less. To witness and not judge, to continue to check-in and challenge our own beliefs and deepen our knowledge. Based on an original, true story by Brian Dorscht. *Roles to be double cast. Small rural town. A simple home. Bobby Radcliffe is sure he has lost his brand-new bicycle. After his parents go out for the evening, he is left with his sister and instructions from his father to “make sure the bike is found and in the garage” before Bobby goes to bed. Frustrated that he can’t find his bike, he returns home and decides to tell a lie to his gullible sister; “A flying saucer came down and took my bike”. Half believing what he says, she asks him for details of how it happened – and a story starts to develop. The sister runs to the phone to tell her best friend what Bobby just told her. The best friend tells her father who is the town Sheriff and tells her he is coming over to the house. Bobby has to decide to either continue the lie, or confess the truth. Surely they would know this isn’t true. But, people in the neighbourhood and around the City get stirred up and excited to know that a UFO landed in their City. It hits the media the next day, and for the next week the location becomes a tourist attraction with Bobby telling his story. What he doesn’t suspect is the arrival of a “mystery man” who shows up with photo books full of pictures of Martians, and moon men, and the inside flying saucers, who just wants to get home. “In his latest play ‘Shine On’ Czuba has taken his innate ability to dissect human relationships through his powerful manipulation of movement, language and sound to a new level. He has shifted the traditional theatrical structure by merging both live action and live song. ‘Shine On’ uses the language of music and contemporary songs to enforce the narrative and challenge the audience’s expectations of the theatre experience.” Tracy McNeil. 75 minutes approx – No Intermission. Eight years ago, Quincy Blak, a one-time Rock God, mysteriously disappeared off the world’s stage. Eight minutes ago, Dia Webber, a troubled wanna-be musician spotted him at a local used record store and followed him home. The play begins at this moment in time and in the course of one night their lives will change in ways they could have never imagined. Threatening to reveal his secret, Dia invades his space and demands to know why he abandoned all his fans. Quincy, not admitting who he is, tries everything he can to get her to leave, but slowly begins to feel protective of her. Triggered by Dia’s accidental overdose, Quincy finally confesses who he is. Quincy realizes that in order to continue to live and make music again, he has to let go of the past while Dia begins to imagine a future. The play is designed to begin as a two-hander transitioning into an acoustic duo performance in a club. The concept is to have the narrative carry over through the two different structures transporting the audience on a larger journey. After Us The Savage God. **Or… If you can swing it – one actor per role. ***UBU appears in multiple puppet forms in various spots on stage as well as embodied in a ‘fat suit’ by the actor playing Herbert. AJ’s small, sparse apartment – Paris – 1902(maybe). Ellen and Herbert’s apartment – Montreal – 2014. The history books all suggest Alfred Jarry died from a combination of malnutrition and a super-human consumption of alcohol. After Us The Savage God will offer another hypothesis – Time travel. With his life long interest in science and cycling, Alfred Jarry secretly managed to build a time machine in his decrepit apartment. He used the knowledge acquired in his travels through time to write his avant-guard and at times incomprehensible plays and novels and in the process create a series of unbelievable characters. One of these creations, the beast known as UBU, decided he would like to become real and tormented Jarry for much of his adult life. UBU inserted himself into Jarry’s world so much that the fabric of reality began to tear apart. Was UBU created by Jarry, or was Jarry created by UBU? The action of the play takes place in the final months of Jarry’s life (but time is beginning to be difficult to measure) as he struggles to finish his Neo-Scientific novel; Exploits and Opinions of Doctor Faustroll – Pataphysician. Jarry, traveling in and out of time and losing track of it, must battle his nemesis, his creation, UBU – or is it simply a projection of himself. The supporting cast is made up of Rachilde, a writer in her own right and editor of the Mercure de France. She is struggling to save Jarry from himself, to stop him from (literally) killing himself. UBU’s Conscience (taken from UBU Cuckold), who lives in a suitcase, valiantly tries to give UBU advice that won’t kill Jarry. Also there is Ellen and Herbert, a corrupt and amoral politician and his equally corrupted Lady Macbeth-esque wife from the future (present). These two vile characters represent all that Jarry was trying to change in his own time. **Warning: Contains Adult language, fluids and depravity. Tech Specs: Six microphones (four on stands), two chairs, four mirror balls. 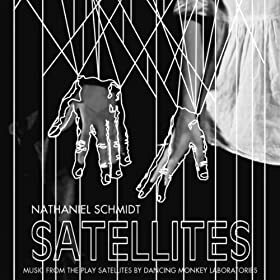 SATELLITES is a play about words, movement, sound and re-connecting to the idea of wonder. SATELLITES is the story of Mark and Vanessa, a young couple who have drifted apart and how technology has infiltrated and infected their lives. It’s a play about communication and connections, to each other and their own bodies. Through several ‘Tracks’ we move along with them as they struggle to make sense of what has happened to their relationship and their lives. From first encounters to living together to drifting part and then attempting to find each other again. Through metaphor and hurtful truth, they tell their story to each other and to the audience, looking for some kind of reprieve, for someone to tell them that everything will be ok. The lies they tell each other are simultaneously exposed through the presence of two Dancers who are subtext come to life. As Mark and Vanessa try to pretend that the damage they’ve done to themselves is manageable, the Dancers show us a deeper truth. Satie et Cocteau: A Rehearsal of a Play of a Composer by a Poet, is a play about the classical music composer Erik Satie and his complex relationship with the surrealist poet Jean Cocteau. We are watching Cocteau direct an American Actor in the role of Satie in a play that Cocteau wrote in 1939 called Soyons Vulgaires. The play takes place 15 years after the death of Satie. The action takes place during the final rehearsal where Cocteau has only called the Actor, because he feels he does not fully understand the role. Cocteau, in an opium haze, directs the Actor in a series of ‘scenes’, which run the length of Satie’s life and career. We discover that Cocteau’s intentions are for the Actor to fully embody Satie and bring him to life so he can finally exorcise him from his life. The play embraces the absurd and the meta-theatrical, which permits the ‘staging’ of sections of Satie’s life as they suit Cocteau’s narrative. Through the arc of the play we discover Satie’s desires and philosophies about art and music while simultaneously discovering the drive behind Cocteau’s ambitions. On a half finished set, with live music played on two pianos stacked on top of each other, cardboard skyscrapers and a large shadow screen, with puppets, reminiscent of the Chat Noir in 1920’s Paris, Cocteau and the Actor embark on a journey through time and theatrical space which the Actor describes in his opening monologue as: “What you are about to see is a re-creation of a memory of a memory of actual events.” Satie et Cocteau: A Rehearsal of a Play of a Composer by a Poet is a play about the reality of memories, the possession of art, and the ‘truth’ of the theatre. Tech Specs: Minimal set. Mostly hand props, Large Boom Box, Squirrel armour. A revolutionary squirrel named Don Marcos and a shy young girl named Katherine join forces to defeat two school bullies who have conspired to steal Katherine’s class project. On a larger level, their partnership also allows Don Marcos to come to terms with a family tragedy and helps Katherine to find her voice. With a shared love of adventure, these two outcasts discover that dreamers all speak the same language. Old Man – (M) 45 to 55. Girl – (F) 14 to 18. Setting: A Bridge, a schoolyard, a street, but the space needs to be abstract. Tech Specs: Minimal set. Hand props, mostly sounds and light/video design. The story tells of a chance encounter between a young girl desperate to escape the torture of cyber-bullying and family violence, and a homeless man who, in a moment of human instinct, saves her from an attempted jump off a bridge. This brief moment of contact sparks an improbable but touching relationship between two lost souls who just might be able to keep each other from leaning too far over the edge. At its heart, HOPE IS DEAD is about intersection: Intersection between faith and despair, between safety and chaos, between the light and dark pockets of society, and, most importantly, between two characters whose lives become intertwined as they try to find their way through personal tragedy and public ostracization. It is about the potential for two seemingly unconnected, uncommon, forgotten people to create something magical. Published by Original Works Publishing: Click Here. I AM I is an absurd exploration into the duality of the modern man. One side wants to quietly merge into the traffic of the masses, while the other side wants to cut a new path through the wilderness. I AM I is play that exists on several levels, a meta-theatrical experience where the truth of what we’re seeing is always in doubt. Man #1 and Man #2 are locked in a life long struggle between the desired and the rational, never fully understanding that one without the other means nothing. This battle of ideals comes to head with the introduction of Sonya, the latest object of interest and the metaphor for all that came before. Not only does she represent the women, but the identity of their very soul. I AM I exposes the inner workings of a dark heart and an over-worked mind, shattering any idea of a fourth wall and creating a visceral, energized, funny and painfully honest piece of live theatre. (The ‘He’ and ‘She’ of the characters can be ignored for casting but kept as-is in the text). Location: A jail cell, dreams, a theatre. Duration: Between 55 minutes and Sunrise. KARL NIMENI IS NOT DEAD – I KILLED KARL NIMENI is part Dada, part surrealist, part existentialist but mostly this play is influenced and structured based on the teachings and research of Karl Nimeni. Charles Fleming is in crisis; nothing makes sense or allows him to follow the flow of existence. Being is becoming difficult. We meet him in a jail cell, charged with the murder of Karl Nimeni. The only evidence against him is a dream. He speaks to the audience or the jury or his god or himself. His reality has been compromised by his own dreams. We learn that he believes he is innocent because Karl Nimeni murdered him. KARL NIMENI IS NOT DEAD – I KILLED KARL NIMENI is a night play, a theatrical poem, a moment in time and a narrative dream. It is a play that is more than it seems and less than is known. **Karl Nimeni is a pioneer and an absent mentor for everyone who goes on to explore the night, dreams and the Unclear in his/her own way, between art and science. Chorus: (M/F) 6 to 14 actors in skull make-up. Choric dialogue can be spoken by one member or several. Setting: The play takes place during the First World War in Germany. Red Rosa, Bloody Rosa is a play about Rosa Luxemburg, a stubborn polish Jew with a bad hip and chronic stomach pain, which is not the standard description of one of the greatest revolutionaries of our time. She was a scholar and socialist, before socialism was high-jacked by the fanatical. She fought for workers rights but had a love of fine art and music. She was a woman who would not let a man dictate what she did but was a romantic at heart. She never took herself too seriously but somehow knew she would be a martyr. Rosa Luxemburg was a brilliant orator and her speeches against what she saw as imperialist leaders sending the world into the First World War drew bigger and bigger crowds causing the government of Germany as well as members of her own party to fear her. They threw her in jail during the war to silence her, but it didn’t work and with the help of a few loyal comrades she was able to get her writings out to the people. The play begins in 1914 and ends in 1919, the year she was assassinated. The structure is episodic and operatic, ‘Epic’ in the Brechtian sense. At once didactic and emotional. Using a traditional chorus with modern projections and silhouetted ‘expressionistic’ action behind a scrim, Red Rosa, Bloody Rosa brings you on a theatrical journey through a dark history. *This is not meant to be a factual biography, but a tribute to the intelligence, courage and humanitarianism of the woman herself. Upon learning of his father’s death musician Steven Booker spends an agonizing and fantastical day and night trying to dismiss the man he hated so much but knew so little. Through a series of memories and the reality of his current situation, Steven Booker discovers that he is very much his father’s son. As hard as he tries to avoid it, only by going to his father’s funeral will he be able to move forward and become the man he wants to be and not the man he has become. The story is structured like a song with music used to propel and increase the power of the narrative without removing the audience from it. Hearing a Fender Rhodes piano being played alone on stage is magical. Hearing the memories of a father not understood can be universal. The play is long on questions in the form of presenting situations and opinions, right or wrong. The work is contemporary, naturalistic and surreal with an aesthetic that is understood with fantasy never too far away. Location: One apartment acting as two. Two men and two women try to navigate through the mysteries and lies that surround love. Three will find an answer of some kind while one will continue to be lost. Trevor has had no luck with women, while his roommate Dan can’t seem to get enough. Trevor believes himself to be so deep, while Dan only wants to live in the moment. Beth is looking for something she can’t explain, while Jazmyn searches for meaning. Beth will lie to herself to find it, while Jazmyn doesn’t have the time. Trevor uses Beth to feel alive, while she uses him to feel anything. Dan makes no promises to Jazmyn, while she looks for something in Trevor. Each wondering what makes the other so special, what make them remotely desirable and are we really as interesting as we think we are? The language jumps from poetic to visceral and always honest. Words are used as weapons and truth is the innocent casualty. The Elusive will confront, question and force itself into the audience darkest thoughts and desires and will demand that answers be given. Anna Jenson: Mid-thirties, married, 2 children. She feels imprisoned. Gabriel Martin: Mid-thirties, single, always working an angle. Desperate. Setting: Gabriel’s one room apartment. Waiting on the Thunder is a play about the violence of memory and the fragility of denial. Anna, a married mother of two finds herself in her ex-boyfriends apartment after a fight with her husband. Gabriel seems supportive and possibly the one that got away. As the evening unfolds, the truth of their memories deteriorates into lies and the reality of their lives can no longer be hidden. A contemporary story of love, lust, longing the power of words and the need to demand what love has advertised. Abstract in space but realistic in content, with dialogue that shifts from direct, everyday conversations to passionate monologues. Quin is quiet, shy, and just plain awkward really. He’s in love with his best friends girlfriend and as that relationship starts to unravel, Quin anonymously starts leaving Lissa letters at the bar where she works. All the letters say is “Tell me a secret”. Lissa ignores them but over time and numerous letters, she slowly reveals passionate desires, and begins to fall in love with this mystery writer. Complications arise through the introduction of the larger group of friends and their intertwining relationships. Was it betrayal or passion? Can you fall in love with words? Can a secret ever be revealed without heartache and when all is said and done, what’s more important, following your heart or ignoring it for principle? ELLEN: Wife. Mother. Homemaker. Proud. Tired. A little scattered. STEPHEN: Husband. Father. Executive in large company. Controlling. Guarded. Sighs a lot when he talks. WILL: Ellen’s brother. Free Spirit. Dreamer. Has the arrogance of the slacker. *There are two young children we never see, only hear. Ellen, an abused house wife is in a very dark place, but after the accidental death of her younger, free spirited brother, she finds the courage to free herself from her marriage and as a result, save herself and her children from the ‘Black air”.